David Eugene Smith's parents were Abram P Smith (born 9 April 1831 in Virgil, Cortland County - died 4 July 1897) and Mary Elizabeth Bronson (1837-1871). The Smith family were originally from Germany and were descended from Henry Smith who was born in Germany in 1748 and died in Virgil, Cortland, New York, in October 1829. Abram P Smith, the son of Nathan Smith and Lucy Mallery, attended Homer Academy and the State Normal School at Albany, intending to become a school teacher. However, after teaching for two years at Marathon, New York, he decided to read law and was admitted to the bar in 1856, becoming an eminent lawyer. In 1868 he became surrogate judge of Cortland County. Mary Bronson, the daughter of Dr Horace Bronson and Polly Ball, had been taught classical languages, science and natural sciences by her father. David Smith had a sister Clara who married Alden March Jewett and lived in Cortland. ... he could speak both Latin and Greek as a boy, and much preferred studying the Classics to weeding the garden or other chores assigned him by his father. She took her son on many excursions round the Great Lakes where they studied nature, visited historic sites and viewed art exhibitions and museums. David began studying at Cortland Normal School, located off Church Street in Cortland, New York, in 1869. This was a new school which had been authorised by the New York State Legislature in the previous year and, after the Board of Trustees had been appointed and the school organised, Smith began his studies as soon as classes began. We note that the original campus was destroyed by fire in 1919 and the new campus, opened four years later, is now the State University of New York College at Cortland. ... he could read the Bible in its original language, and he once expressed the opinion, "If you want to find the beauty of the Bible, read it in the Hebrew tongue, especially the Book of David." He made his first trip abroad in the summer of 1879, in the middle of his undergraduate studies, going to Europe where he continued his passion for collecting objects such as money, shells and antiques. Back at Syracuse he completed his undergraduate studies and was awarded the degree of Bachelor of Philosophy in July 1881. After this, he followed the route that he had planned for some time and began to prepare for admission to the bar. While doing this he also served as an apprentice at his father's law office. Smith was now following a surprising number of different paths for, in addition to his law studies, he went twice a week to Syracuse University where he was undertaking graduate studies in history, modern languages and mathematics. He also continued his love for travelling making visits to both Central America and to South America. His father, Abram Smith, had been elected as a judge of Cortland County in 1867 and served in this role for 16 years. After retiring from the bench in 1883 he set up with his son as A P & D E Smith. We note that at Abram Smith's his funeral it was said: "No attorney in the history of this county ever worked harder or more successfully for clients without expectation of reward than he did." In 1884 David Smith was admitted to the bar and was also awarded the degree of Master of Philosophy by Syracuse University. Now with a Master's degree and setting out on a promising career in law, Smith received a request by the Cortland Normal School to help them out by teaching some mathematics courses, standing in for an absent teacher. This he did and discovered not only a love for mathematics but also a love for teaching. When the Principal of Cortland Normal School, delighted with Smith's performance, offered him a permanent position, he was happy to accept. Not only did he teach but over the next couple of years he continued to undertake certain tasks as a lawyer in his father's firm. However, remarkably, he also continued with his graduate studies at Syracuse University. He received a doctorate in the history of fine arts in 1887 for his thesis Polygnotos Ethographos, Polygnotos the Painter of Character, gave up his work as a lawyer and, at Cortland Normal School, added the teaching of the history of mathematics to his teaching of arithmetic, algebra, plane geometry, solid geometry, and trigonometry. On 19 January 1887 he married Fanny Taylor (12 February 1865 - 11 January 1928) who had been born in Cortland, New York, the daughter of Charles Culver Taylor and his wife Sarah Stickles. ... the library facilities in the line of pedagogy of elementary mathematics are now the best in the country. 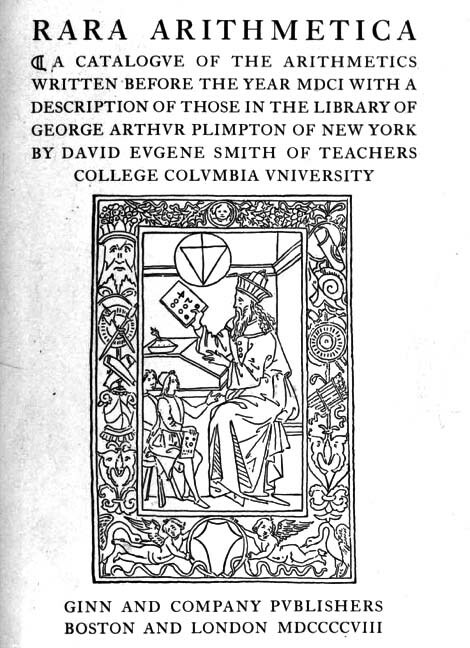 As Plimpton later recalled [in a letter to Smith written on 19 January 1933], Smith's introduction to his textbook collection occurred when Smith was principal of Brockport Normal School. During a visit to New York, he visited Plimpton's home, then on Thirty-Third Street, and what he saw must have enticed him to consider relocating to New York. From their first meeting, Plimpton recognized Smith's expertise and appreciated his resourcefulness. When Dean James Earl Russell sought out Smith at a professional meeting in 1901 to offer him the chair in mathematics at Teachers College of Columbia University, he quickly accepted and moved to New York for the fall semester. Your books kept me awake half the night after our pleasant evening with you. But it was a delightful insomnia. The students in the seminary in the History of Mathematics under Dr David Eugene Smith have been privileged at various times to visit the unique private library of their instructor and to use such manuscripts as were necessary in their field of re search. The inspiration derived from examining these price less objects has stimulated one of the pupils to write the following account. ... This library of historical, mathematical material is one of the most interesting of its kind in the world, not only because of its size, but because of the very rare volumes upon its shelves. Books of all periods of history and of all countries are found there. Early historic tablets, original manuscripts, autographed letters, presentation copies and first editions as well as rare translations are included in this excellent library. Dr Smith has personally collected these rarities during his numerous travels in Europe, Asia, Africa and South America and has spent much time and money as well as care in selecting them. He has received them from friends or bought them in bookshops, but more often he has ingeniously gathered them from remote and obscure places, with the view in mind of pre serving them for his students. The collection is more than a collection - it is an expression of the interest and personality of Dr David Eugene Smith. A few years ago I gave to the university my library on the history of mathematics, consisting of upwards of 20,000 items-bound volumes, manuscripts, portraits of mathematicians (about 2,700 engravings and 160 medals), catalogued monographs (2,000) and 4,000 letters, including such leaders as Newton, Descartes, Leibniz and the Bernoullis. For use in my lectures I had, over a period of more than 40 years, collected more than 275 instruments of early and medieval times for purposes of calculating, measuring (lengths, areas, volumes, weight and time) and astronomy (navigation, astrology, and the calendar). It therefore seemed appropriate that this historical-mathematical material should be placed alongside the books, many of which describe and illustrate the instruments themselves. Smith published a remarkable number of papers and books. See THIS LINK for an Overview of his publications and links to the other material in this archive related to these publications. You can also click on the links at the end of this article. In February of this year Professor David Eugene Smith retired from active service at Teachers College. At this time his students and colleagues arranged for presenting to the College a portrait of Professor Smith and, at a dinner in his honour, they endeavoured to express to him their appreciation of the uniqueness of his work and their regard for him as a friend and teacher. Doctor Smith's influence on the teaching of mathematics is such that it seems appropriate that the interpretations of his contributions as given on these occasions be made known. The article  in this part of The Mathematics Teacher contains the speeches made at the dinner held in Smith's honour. Retiring for Smith certainly did not mean that he led a quiet life and he continued his love for travel (in fact during his life he made eighty Atlantic crossings). For example he spent four months in winter 1932/spring 1933 in Persia (now Iran), Iraq and Syria. He was able to obtain about 150 manuscripts during these months in Persian, Arabic and Hebrew which were either translations by the Arabic scholars of Greek texts or were works by mathematicians such as Omar Khayyam. In due course of time you became not only a famous teacher in the United States but, internationally, a historian of mathematics, respected, loved, and honoured by mathematicians from one end of the world to the other. I cannot let this birthday go by without telling you how much I appreciate what you have contributed to the happiness of my life and to that of Mrs Plimpton. I want to assure you that you have my best wishes ... for I everlastingly believe in you, what you have stood for, and what you have accomplished. Ever your sincere friend, George A Plimpton. As to the subject of investigation, I suggest as very important "The Present Trend in the Teaching of Mathematics in the Several Types of Schools in the Various Countries of the World." I therefore offer the following resolution - "Resolved that we proceed at the meeting of this Section two days hence to elect a new International Commission on the Teaching of Mathematics, said Commission to report at the Congress to be held at Oslo in 1936; and that this Commission arrange for national committees according to its best judgment." If, as I anticipate, this shall bring younger men and women into the Commission, while retaining older members where this is thought advisable, and if it shall result in the vigorous prosecution of some such study as the one which I have suggested, it is my hope that this method of procedure will be continued in future Congresses. The teaching of mathematics should never be static; it should be a dynamic force which should result in continued study and in informational quadrennial reports to the Congresses of the future. We have already noted that Smith's wife Mary died in 1928. He remarried in 1940 when eighty years old to Eva May Luse who had been one of his co-authors on Walks and talks in Numberland (1929), The problem and practice arithmetics (1929) and Junior arithmetic (1930). Eva May Luse (born 15 September 1877 in Oxford, Iowa - died 25 September 1969 in Los Angeles, California) served on the faculty of the University of Northern Iowa from 1906 to 1941 where for over 20 years she was head of the teaching department. His wealth of knowledge was gleaned in many countries and in many languages. A scholar and a great teacher, he was loved and revered by all who had the good fortune to know him. One who would aspire to marked success in any branch of the history of mathematics must be possessed of certain abilities rarely combined in a single individual. He must know much more of mathematics than what he proposes to include in his study - the offshoots from these branches and their relation to the science as it has developed since the period of their inception. He must possess a working knowledge of the classical and the principal modern languages, the former for his source material and the latter for the interpretation of this material by later writers. He must be able to express himself with precision and with a degree of elegance that will command the respect and the attention of those who will probably read his works. He must be erudite but not bookish, philosophic but not pedantic, profound but not dull. Finally let us note Smith's many contributions to the American Mathematical Society, the History of Science Society and the Mathematical Association of America. Smith was vice-president of the American Mathematical Society in 1922, was associate editor of the Bulletin of the American Mathematical Society from 1902 to 1920, and the Society's Librarian (1902-20). He served as president of the Mathematical Association of America in 1920-21. He was the founder of the History of Science Society and founded the journal Scripta Mathematica.